Tour Aotearoa, the longest and most varied ride in New Zealand, was completed in February this year. This awe-inspiring bikepacking event took riders 3000 km from the tip of Cape Reinga all the way down to Bluff. The track included several Great Rides throughout the country, connected by the best available back-country roads. The lead bunch of riders sweeping onto Ninety Mile Beach, Northland. Tour Aotearoa brought together riders from all pedals of life. This year 250 people took part in this inaugural event, 190 were from New Zealand and 60 were overseas visitors. The completion rate was high with 90 percent of participants finishing within the set time of 10 to 30 days, and age proved to be no barrier with riders ranging from 21 to 73 years old. Two riders crossing a 141 m long bridge on The Timber Trail, Pureora Forest Park. The event was run in a brevet style, which is an increasingly popular style of bikepacking where riders are completely self-supported throughout their journey. This meant they had to carry their own gear with no outside help or support vehicles. It was just the rider, their bike and the open road. 'foot cycling' between Big River and Waiuta ghost town, West Coast. Additionally, participants contributed to a charity of their choice, and through the hard work and sweat of these riders they raised over $230,000. 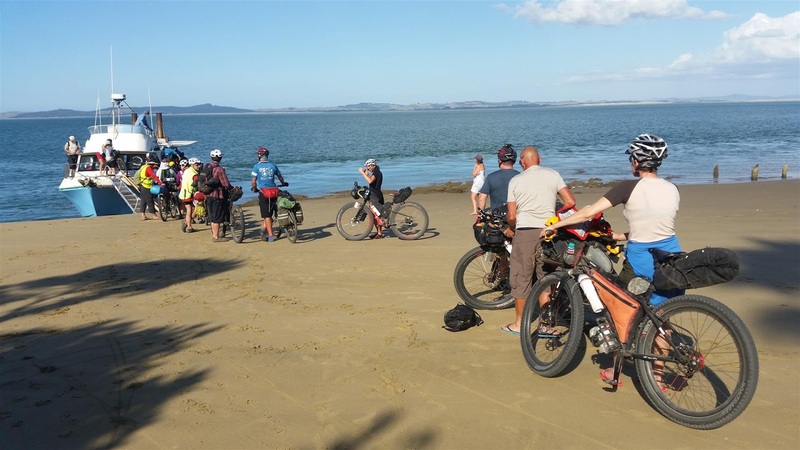 Riders at Pouto Point boarding the boat to cross Kaipara Harbour. The organiser, Jonathan Kennett, is now hard at work writing a guidebook for Tour Aotearoa so anyone can do the ride at any time. This will be a unique addition to the collection of books published by the Kennett Brothers. After 3000 km, a very welcome sign heralds the end of the big bike adventure. Jonathan Kennett will also be organising another event for 2018. Be sure to check out the Tour Aotearoa Facebook group and website to keep updated on upcoming events.